You customize your wedding rings because you want them to be uniquely you. You might want a rose gold ring or you may love the look of mixed metals – a beautiful and unique style choice. Customizing your wedding rings requires you visit a jeweler that is easy to work with and knows the ins and outs of wedding rings. In Fort Worth, TX, Kubes Jewelers is the place. It is a jewelry firm where the employees are related. That’s something you don’t come across very often, so they must be easy to work with. Kubes Jewelers has three GIA Graduate Gemologists and two GIA Diamond Graduates. They know their stuff. For being such an impressive family-owned fine jewelry business, we choose Kubes Jewelers of Fort Worth, TX as our Coast Diamond Retailer of the Week. “Kubes is a Fort Worth tradition. The decades-old retailer, in the heart of TCU, is still family-owned and trading on a long reputation of service, merchandise quality and value.” They have been “Best of” Fort Worth, Texas Magazine for 2009, 2010, 2012, 2013, 2014, 2016, 2017, & 2018! A Coast Diamond ring can be customized by changing the size (0.25 to 5.0 ct) or shape (oval, princess, pear, etc.) of the center stone. Choose our Coast Diamond halo engagement ring (LC5410-OV pictured above) because of the endless possibilities to customize it with Kubes Jewelers. Visit our Coast Diamond site to see some examples of the customization of this ring. 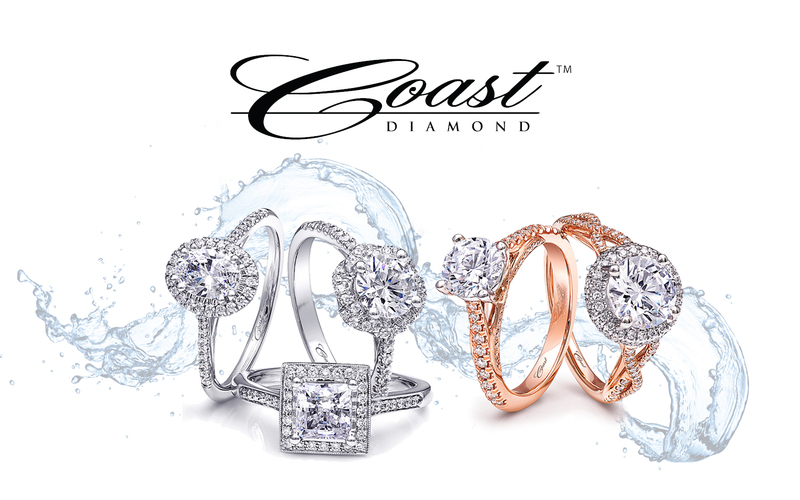 Coast Diamond rings are available in (14K or 18K) White, Yellow and Rose Gold, or Platinum. Choose this Coast Diamond band (WC20089) to accent your engagement ring and to stack with other rings. You can stack rings of different metals to create a truly unique set. Choose a Coast Diamond ring with your favorite gemstone, sapphire or ruby. Continue to customize your wedding rings by choosing a Coast Diamond band with sapphires and diamonds (WC7040-S). Our Coast Fashion Collection has a wonderful selection sapphire and ruby rings. Congratulations to Kubes Jewelers of Fort Worth, TX for being our Coast Diamond Retailer of the Week! Click here to find a Coast Diamond Authorized Dealer near you.